What Would Change In Your Life If Anxiety Wasn't Driving Your Day? It can be an overwhelming and chaotic world out there. More so every day. Do you find stress and anxiety impacting your relationships, controlling what you do and don't do, running your life? Today many people in Orange County are struggling with overwhelming feelings of stress, fear, and anxiety. Even panic. It can feel like too much to sort through on your own. Alone. Your stress and anxiety have the power to undermine every aspect of your well-being: physical, emotional, relational, spiritual, professional, and financial. Everything. When your anxious feelings are overwhelming you, it can feel like there is no solution. You can create a shift in your life. You can reduce your anxiety and panic. You don't have to do it alone. Help is available. Transform Your Pain Into Hope and Freedom. You hold a beautiful untapped power in your mind and body to create your potential for healing and relief. One small step at a time is enough to make the difference you are looking for. You can shift from your old fear and anxiety based thinking to increased calm and ease. All you need is someone to show you how. Anxious coping strategies you learned in childhood can be unlearned and tamed. You can change the way you are experiencing your life. Learn How to Heal Your Heart and Mind. Every day people just like you are healing their emotions, hearts, minds, and relationships in my office. I have seen my clients literally transform their lives and relationships. Over and over again. I have seen my clients, people just like you, heal their lives. This transformation inevitably arises from opening your heart. And your mind. Learning to let go of your Critical Internal Voice. Learning how to self-regulate and calm yourself. You can learn this. One small change at a time. You can create the life you are looking for, step by step. I will walk right beside you as you do so. in the Lovely Cabrillo Park Area. Trained as a depth and somatic psychotherapist, I specialize in holistic body-mind approaches to anxiety reduction and resolving trauma. I am experienced in counseling individuals, young adults, couple counseling, families, artists, writers, therapists, and therapist associates and students. I passionately believe in the capacity of human beings to re-create their lives. You can change your experience of your life by changing the way you think about yourself. The way you treat yourself and regard yourself. Your relationship to yourself completely defines your relationship to others. When you create a healthier happier self, you are also creating happier and more satisfying relationships with others. Together, we will use a variety of tools and approaches to understanding your experience of yourself, your life and relationships, including observing patterns, developing increased insight, mindfulness, Somatic Experiencing, enhanced body/mind connections, exploring myth, dream, and metaphor, as well as elements of Cognitive Behavioral approaches. Addressing Anxiety, Panic, and Trauma. 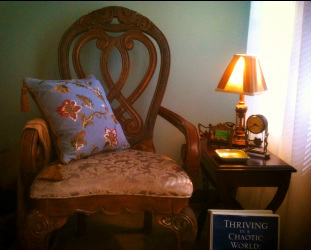 I offer psychotherapy services to individuals from throughout Orange County, as well as, couple counseling. Most of my clients are adults working to improve relationships, reduce anxiety, increase self-esteem, resolve trauma, and increase personal growth. As so many of my clients are working to heal debilitating experiences of anxiety and panic, I have sought specialized training in the area of holistic anxiety reduction. I am a certified Somatic Experiencing Practitioner (SEP). This dynamic healing modality works directly with the nervous system, going places where talk therapy can not always reach to release undischarged fight, flight and freeze impulses from the body. Our body holds our memories of trauma, loss, and grief. These trapped experiences power our anxiety, our impulsivity, our explosive rage and may deeply and unconsciously influence not only the way we show up in our relationships, but our ability and inability to form healthy enduring attachments. Incomplete impulses within the nervous system often contribute to pain and conditions that are resistant or unresponsive to standard therapy and medical treatment. We can work together to give you more access to the self healing capacity of your body. You can locate your innate well-being and allow it to show more fully in your life and experience of yourself. I Blog About Anxiety, Panic, and Self-healing. There are lots of approaches and viewpoints about anxiety and anxiety reduction. I favor an approach that is non-pathologizing, body-centered, and focused on the cultivation of healing, self-regulation, and compassion. I do so in a manner that is informative, educational, and filled with good and sometimes irreverent humor. Stop by and check it out. My Latest Blog:﻿﻿﻿ ﻿KonMari And Anxiety Reduction. Is The Life Changing Magic Of Tidying Up Therapeutic? Located on the Tustin/Santa Ana border, just off the 5 and 55 freeways at 4th Street, serving the areas you live and work in: Tustin, Orange, Irvine, Newport Beach, Costa Mesa, Anaheim, Anaheim Hills, Yorba Linda, Garden Grove, Santa Ana, San Clemente, Long Beach, and surrounding Orange County locations.